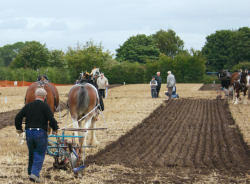 The ploughing match is held on the last Wednesday of September every year and has been running for about 80 years. 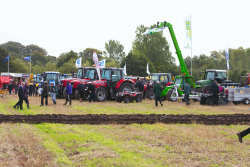 You can find all sorts of ploughing and land management equipment and watch everything from horses to the biggest modern tractors at work. This year Phil had the pleasure of Bud his works experience pupil, seen here with Phil, and myself. Unfortunately we did not have the pleasure of particularly pleasant weather - cold wind and then rain. The pictures above show the various stages of ploughing over the last couple of hundred years (horses are a recent introduction to ploughing before them it would have been Oxen). For me the stars of any ploughing match have to be the horses. Today it would be a rare sight to see horses actually working in this capacity outside of such events as these in the UK. Still it is worth remembering that they were still a common sight up to the middle of the twentieth century. The original use for these horses was not so pleasant, they were bred for war. 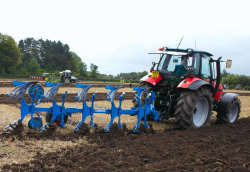 The aim in a ploughing competition is to prove that you can plough the neatest straightest furrow. 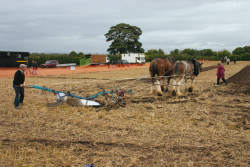 The photographs below compare the three ages of ploughing shown above. This first picture shows a one man two horse team. This combination could probably plough about 1/3 of a hectare a day (approx 8hrs). 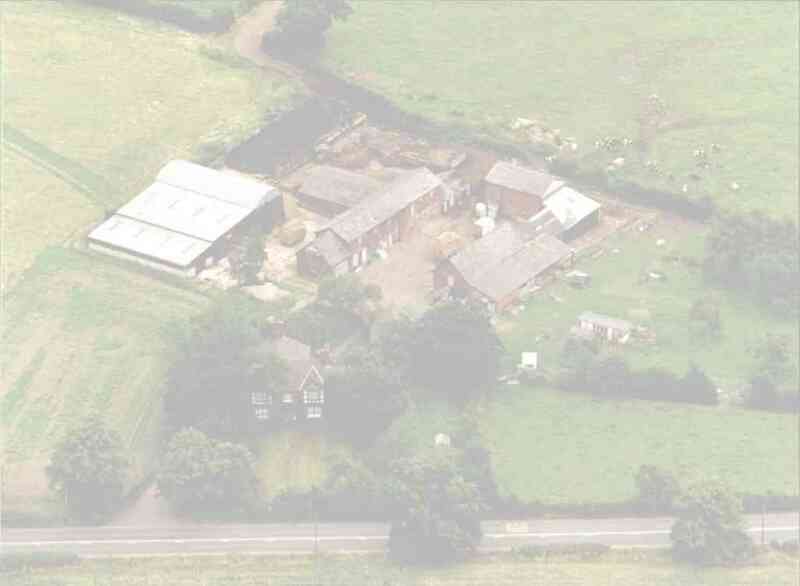 As you can see their making a reasonable job of their plot. In this picture a small Ferguson (at least I think it is, Phil's the expert) attempts the same task. Notice that the depth of the furrow mad by this plough is much deeper that that of the horse drawn plough. 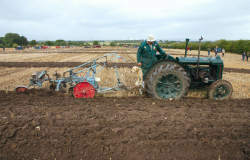 Also the plough drawn by the tractor creates two furrows at once. This combination could probably plough the same 1/3 of a hectare mentioned above in about 1.5hrs. Our third candidate is a SAME International tractor. It has 100hp and is pulling a reversible 5 furrow plough. Also a closer inspection of the ploughs blades shows that they are slatted rather than one solid blade. This saves on weight. 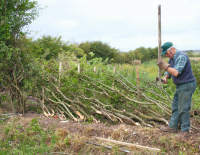 Our final couple of pictures show another now uncommon job, that of hedge laying. Why do this? I hear you ask. Well the function of a hedge is basically to help keep animals (cattle , sheep etc.) either in or out of an area of land. Unfortunately gaps always develop between the stems of the hedgerow plants and animals always find and push through them. 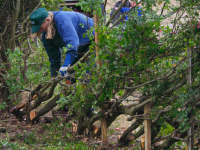 By laying a hedge and bending the stems of the plant sideways the gaps can be closed. New growth further helps to re enforce the "layed" hedge and forms a very sturdy and effective barrier. A close inspection of old hedgerows often reveals signs of laying that have taken place many years ago and more than once.